Fears over the outlook for the Australian economy and doubts over the RBA’s outlook for monetary policy continue to grow as the deterioration of Australia’s housing market gathers speed. The deterioration of Australia’s housing market has continued to accelerate, driven by a sharp pullback in new credit growth. The latest data continues to show that investors are pulling back from the market in droves with new lending approvals down 4.5% for the month to be down 37% from the recent peak prior to macro prudential lending controls being announced by the banking regulator. 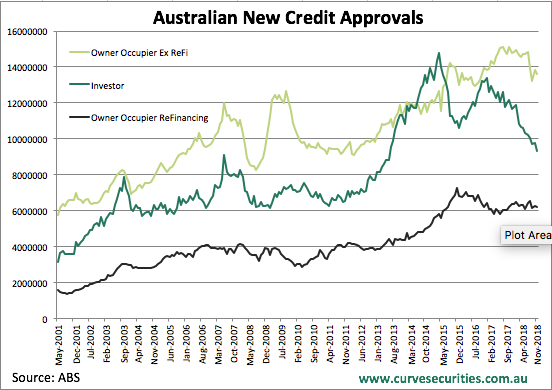 It isn’t just investor demand that is falling with new owner occupier lending also sliding. The value of new lending to owner occupiers was down another 1.7% excluding refinancing to be down more than 10% from its peak. As a result, total new lending is now down over 17% from its peak which goes a long way to explain the fall in house prices. The more recent house price data, which showed price falls accelerate in December and are on track for another large fall in January, suggest that new lending approvals are still falling. The RBA and Government are worried about it even before the release of the final report from the Royal Commission, which in itself is likely to contain recommendations for even tougher restrictions on lending. Where the housing market goes is very important for the outlook for the Australian economy. The deterioration in the housing market has seen market expectations for the outlook for monetary policy soften with each release. The market now has a cut in the cash rate at nearly 75% pricing in for Q1 2020. It sets an interesting scene ahead of the RBA’s next update due in a couple of weeks.